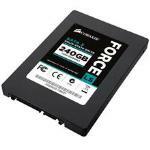 Corsair Force LS CSSD-F240GBLS 240GB Expert Reviews - Read Reviews and Buy Smarter Online. Verdict: The performance of the Corsair Force LS is not particularly high. In the synthetic benchmarks it mostly "achieves" one of the last places, just as in the more practical PCMark benchmark. The Force LS is an entry-level solution, therefore new performance records were of course not to be expected. Verdict: The Force Series LS is Corsairs cost-effective range of SSD, and it's slim too as it's 7mm in thickness. Verdict: The Corsair Force LS SSD is no slouch by any means, however its price tag may be a bit too steep for what it is offering to the consumers. Verdict: There have been a number of incarnations of the Force Series drives from Corsair with the first having the SandForce 1200 series controller. Hence the name. Most have been performance focused and were the Corsair flagship drives for a time, a title currently held by their Neutron GTX line. Verdict: Had to do a restart after trying a shutdown (power source and everything) in order for drive to just show up in Device Manager and Corsair Toolbox as an option to clone to. Cloning a drive requires the c: drive AND the Boot Drive partition in order for the drive to boot up. I didn't know this. Verdict: You get what you pay for. You can get this drive for 30-40$ on sale. Not as fast as the high end SSDs but will surely beat a spinning hard drive. Bough it for an old computer and made it enjoyable again. Verdict: This drive died whilst making a clone copy using Corsair software. This is the second Corsair SSD drive to die whilst cloning, yet I have cloned other drive with no problems. Verdict: Quality drive as expected from Corsair. Have used many of their products and never been let down. This drive was easy to install and worked perfectly as a boot drive for a new build. Ultimate bang for the buck.